Myanmar is undergoing a rapid transformation and the results of November 2015 election results speaks for itself. After two decades of direct military rule, six decades of civil wars, and estrangement from the international community, the country has embarked on a process of wide-reaching political and economic reforms. Many political prisoners have been released, media restrictions have been relaxed, civil liberty restrictions have been eased, ceasefires have been negotiated with most of the armed ethnic minority groups, and a process of engagement with the global economy is underway. 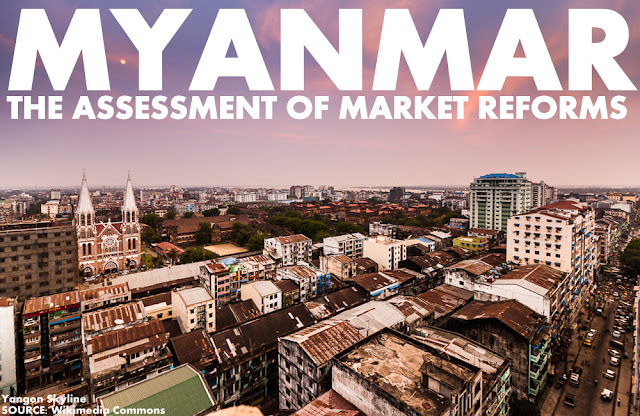 After the 1988 coup, Myanmar's military regime officially abandoned the socialist-era, statecontrolled economic system and announced it would introduce market-based practices in order to improve the economic situation. In reality, the economy remains highly controlled by the state, which restrains market-based competition. Since 1989, the junta has initiated a series of privatizations, including a large-scale privatization in 2009 – 2010, when over 300 enterprises, including a major airline, ports, mines, factories, hotels, cinemas, gas stations, land and buildings were privatized. The balance of power between regime and opposition forces shifted fundamentally in the former’s favour, enabling it to diminish (though not destroy) the threats that had prompted its intervention and withdraw on its own terms. This outcome stemmed from the transformation of Myanmar’s geopolitical and economic context, which supported the regime’s strategies to centralize power and reduce centrifugal challenges, giving it the confidence to resume Myanmar’s forced march to “disciplined democracy”. However, most of the formerly state-owned properties have been transferred directly into the hands of the regime’s cronies or the military conglomerates that continue to monopolize the economy. 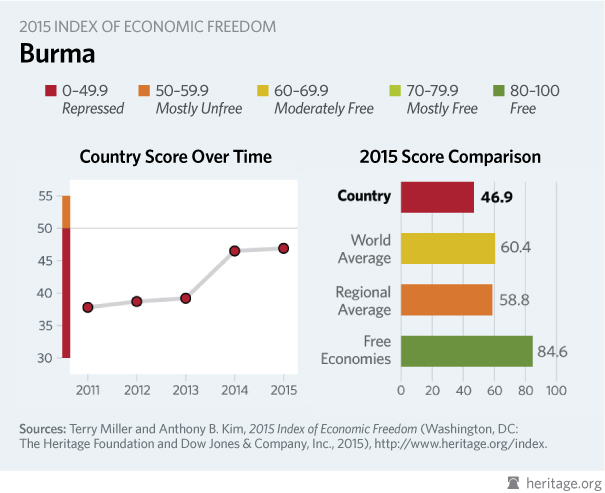 According to the Heritage Foundation’s 2012 Economic Freedom index, Myanmar has one of the world’s 10 most repressive economies. The export tax was increased arbitrarily to 10% in 2008, although it was reduced to 7% in March 2013, making the export market noncompetitive compared to other countries. However, the government and military enterprises do not need to pay these taxes, and some of these have even received subsidies. Two military conglomerates, the Union of Myanmar Economic Holdings Limited (UMEHL) and the Myanmar Economic Cooperation (MEC), the largest economic enterprises in the country, have dominated the economy. In the last two years, the government of Thein Sein has introduced a number of economic changes in order to make the country more competitive and attract serious, long-term investment from Western countries. Export taxes were lowered and restrictions on the financial sectors were eased. On 1 April 2012, the country ended its grossly overvalued fixed exchange rate system, which had been in place for 35 years, and introduced a market-based exchange rate. Steps are now being taken to move to full current account convertibility, possibly before the end of 2013. In the domestic market, there is no market contestability at the level of large enterprises since market leaders are in the hands of the state, the military and a handful of cronies. Although the environment for mid-sized businesses shows better market contestability, market entry barriers for companies are still huge. For instance, it takes three months to register a company, and bribes must be paid to various authorities throughout the process. Import/export licenses and approvals for foreign investments are still controlled by the government. Due to the government’s control of large economic enterprises and the plethora of government regulations, the informal economic sector has expanded. In December 2012, the government of Thein Sein enacted a new foreign investment law that offers tax breaks to investors and allows them to lease private land and repatriate investment proceeds using market exchange rates. Myanmar has been a World Trade Organization (WTO) member since 1995, but because of its extensively controlled economy, foreign trade has not been liberalized in reality. The country’s trade openness ratio is the lowest among its Southeast Asian neighbors. Myanmar also has a large informal trade in arms, narcotics and forest products. Regarding official trade, revenue from gas exports today is much higher than revenue from the country’s traditional exports of agricultural and forest products, gems, and live animals. Gas exports are controlled by the state’s own Myanmar Oil and Gas Enterprise, which co-invests with foreign partners. The remainder of the country’s trade is dominated by two military conglomerates, the UMEHL and the MEC. A WTO member, Myanmar has an official tariff figure that is low on paper. It was 3.9% in 2007 and is likely to continue at more or less the same level. However, nontariff measures appear to be significant, since import and export licenses are considered case by case, and some corruption fees appear to be involved in getting the licenses. Import and export taxes are also high, and if businesses don’t want to pay them, they need to bribe customs officers. There are also import quotas for certain items, such as trucks, buses and certain types of cars. Certain export items are also limited; rice is one such product, for example, in order to stabilize the domestic rice market. Certain other safeguards exist to protect domestic industries such as plastics and food. The banking system still is in a nascent stage of development. The three state-owned banks dominate the banking system and the central bank is directly under government control. A new banking law license allows 19 domestic private banks to operate and permits 32 foreign banks to open representative offices. The country has no proper capital market and has no real market for bonds, which are sold only to the banks. Banks in Myanmar operate under formal regulations, but with little supervision or enforcement and without transparency. This led to a banking crisis in 2003. During the crisis, there was a run on a few main private banks, and the central bank could not help in time. After the crisis, the central bank imposed additional restrictions on the banks’ lending practices, seeking to prevent similar problems in the future. There are currently discussions underway to overhaul the weak banking sector. The IMF’s technical guidance is focused on this area. A new central bank law is expected early in 2013, and a rudimentary money market may exist by the end of the year. Despite Myanmar’s encouraging reforms in recent years, experts point to looming governance challenges, including political power-sharing, sectarian violence, and ongoing reforms. The November 2015 elections were the first nationwide, multi-party elections since the country’s parliament first convened in 2010, and are widely considered Myanmar’s most free and fair polls in twenty-five years. Approximately 80 percent of the country’s thirty million eligible voters cast ballots, and Aung San Suu Kyi’s opposition NLD party won a landslide victory, securing a majority in the upper and lower houses of parliament. Bold reforms that may be proposed by the next government may be watered down by the legislature. The military will not cede control to civilians of its most lucrative rent-seeking activities. The woefully neglected education system will not produce enough quality graduates who can become globally competitive enterprise managers, either. However, all fingers are crossed!